Insensitive to other atmospheric gases, the Carbon Dioxide Analyzer measures carbon dioxide and water vapor in ambient air with unsurpassed accuracy and precision. All without the need for frequent external calibration. The instrument can store data practically indefinitely on its internal hard disk drive and can send real-time data to a data logger through its analog, digital (RS232), and Ethernet outputs allowing unattended long-term standalone operation. Based on high-resolution cavity enhanced direct-absorption spectroscopy, the instrument offers negligible zero and span drift and a significantly reduced need for regular calibration with expensive reference gases (compared with conventional instruments). The Carbon Dioxide Analyzer is designed for applications that require the performance of a reference laboratory without the need for regular calibration with expensive gas standards. LGR’s Carbon Dioxide Analyzer is available in different packages to allow users to select the configuration most suitable for their needs. LGR’s standard rackmount package fits in a 19”-wide instrument rack and requires an external keyboard, mouse, and video monitor. 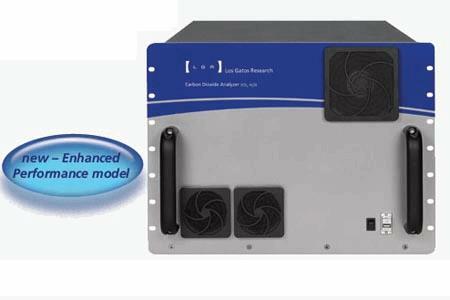 For highest performance, the Carbon Dioxide Analyzer is available in LGR’s “Enhanced Performance” package. The EP package incorporates proprietary internal thermal control for ultra-stable measurements with unsurpassed precision, accuracy and drift. For users wishing maximum portability, LGR’s new “Ultraportable” series provides unparalleled ease of transport for users to carry the instrument anywhere.